How many museums located in historic buildings count the building as their most significant item? And how many make the most of the stories associated with fabric and use through interpretation and strategic collecting? Loudoun House Museum does. It’s located in Irvinebank, a small town near Herberton in the Atherton Tablelands that is renowned for its link to 1880s mining magnate, John Moffat. 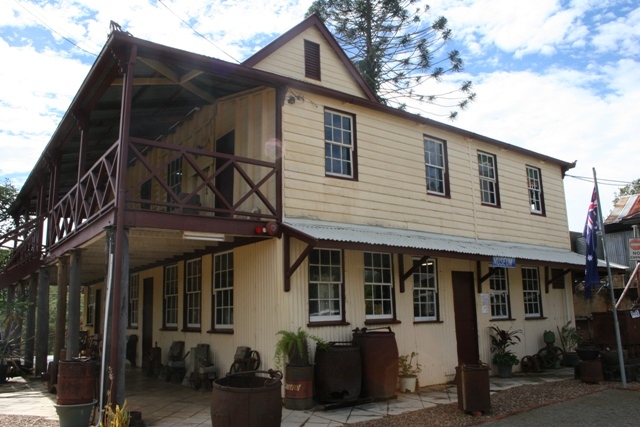 Strategically sited on the top of the hill as you enter Irvinebank from the east, Loudoun House is North Queensland’s oldest high-set timber and corrugated iron house and is listed on the Queensland Heritage Register. Loudoun House Museum’s most significant object: the building. Although some of the original furniture has been removed, Moffat’s original desk and chair are still located in his study. The subtle reminders of how the building was used, as well as its physical association with other Irvinebank buildings through both location, communicate a strong sense of place and of town’s importance during its zenith. Posted on 30 July 2012, in Uncategorized and tagged Far North Queensland;, heritage, historic building, in situ, Irvinebank, Jo, Loudoun House. Bookmark the permalink. Leave a comment.